Boot for cross country and leisure riding made from Flexisoft's patented TPE with a flexible soft zone. This boot guarantees protection and fit in difficult terrain and is also ideal for use in water because of the waterproof neoprene inner and "Pikosoft" front lining. Eskadron's Flexisoft Cross Country tendon boots have easy-to-use double-Velcro fastenings, with a press-stud for extra security. 5 stars Boots are terrific! Although it took about 30 days to get them, I always got a quick email response when checking on my order. 5 stars Look good, do their job, sturdy. The plastic scratches easily, so it's hard to make them look really clean (e.g. for a Pony Club meeting). 5 stars Fab! Great product, very reasonably priced and super quick delivery! 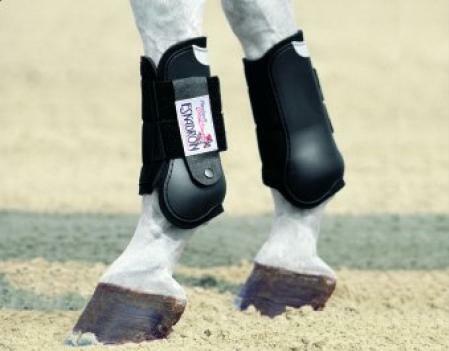 5 stars Perfect for intense cross-country (eventing), with strong Velcro straps to secure them on the horse while jumping.